Restoring vintage bicycles is a wonderful undertaking, made more efficient and rewarding by the existence of technical resources published from days gone by. In order to legally obtain these resources, without violating copyright laws, you may need to purchase the original item in question. 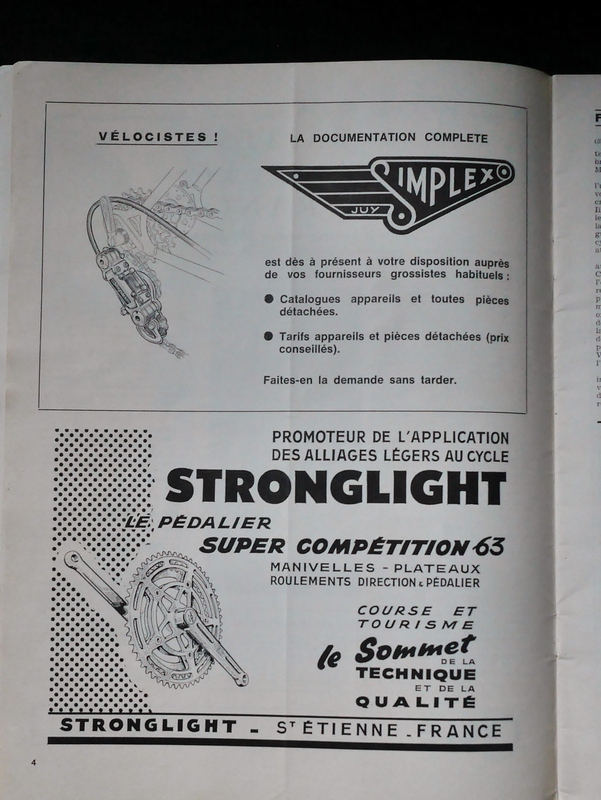 But, can you share such an item, such as an old cycling magazine, without violating copyright law? It would be great if you could, so that others could simply download the material they need and use it in their endeavors. 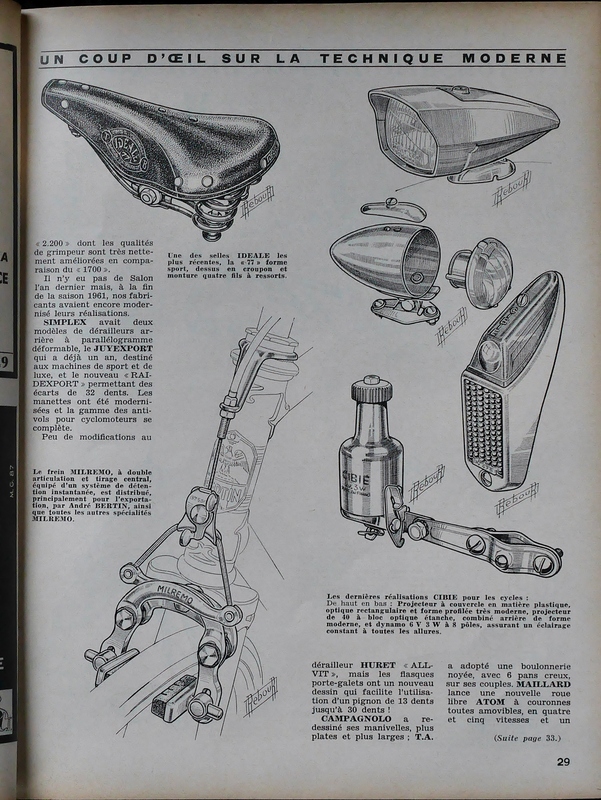 I have occasionally shared pages from vintage cycling magazines and catalogs, such as the page shown above which is from a 1966 issue of Le Cycle Magazine. When I do so, I usually photograph the page in question in an amateur way, in order to discourage unscrupulous individuals from stealing that photo. But what about sharing artwork? 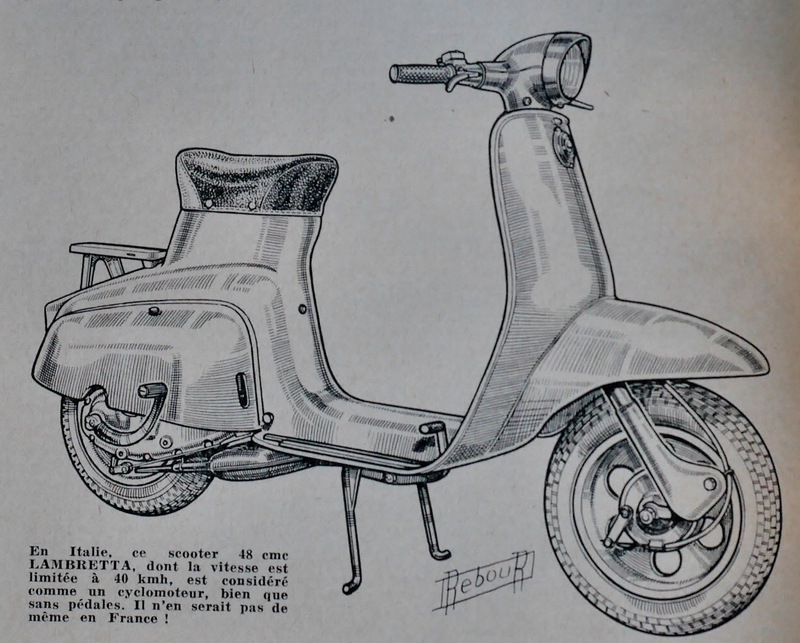 Here is a lovely Daniel Rebour drawing of a 1962 Lambretta scooter. Before I originally shared this item, I conducted an extensive web search to determine who owned the copyrights to Rebour’s drawings (surely, they are not in the public domain, I thought). After finding no record of Rebour’s copyright’s on the French government’s copyright site, I tried contacting the publishers who have used Rebour drawings in their published works by various authors. I wanted to know who owns the copyrights so that I could obtain permission to share the above drawing on my blog site. I heard nothing back. In France as in the U.S., copyright protection extends 70 years after the creator’s death. However, in the U.S. magazine copyrights expire 28 years after publication, unless renewed by the publisher. That shorter time period does not necessarily apply to the individual authors in a published magazine, who may have their own copyrights which last 70 years after death. So, let’s just say that sharing potentially copyrighted material should be done at your own peril, and that you should definitely consult a qualified attorney before doing so. I have taken the trouble to digitize all of the vintage cycling material in my possession, but, pending advice and research from my I.P. attorney, am not able to share these resources yet. If they can be shared, I think the images and articles (learning to read French is a good thing), will prove to be very informative and helpful to those of us who have committed ourselves to keeping these wonderful old machines alive and on the road. And, what’s old is often new again. I am often astounded at the innovations I see in the 1930’s and 40’s, which were long since forgotten, only to be rediscovered again. I have especially noted this in: rack design, crankset styles, centerpull and cantilever brake engineering, shifter applications, handlebar shapes as well as the return to steel as the material of choice for a long lasting frame and comfortable ride. 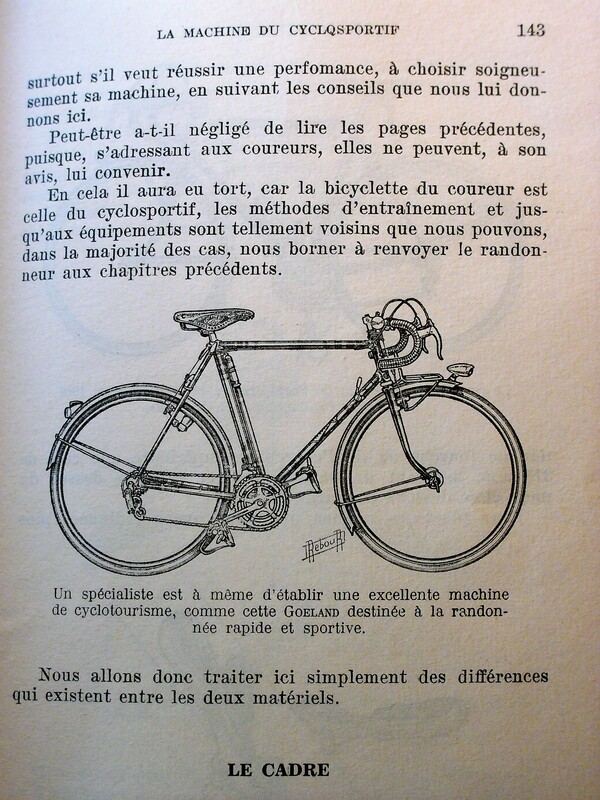 This entry was posted in Bicycle restoration and tagged copyright law, Daniel Rebour, fair use, French copyright law, magazine copyright by Nola Wilken. Bookmark the permalink. Rebour. C’est magnifique! Just bought the book. He’s wonderful. It is hard to imagine what cycling history would have been like without Rebour to document it so beautifully. We would be much less enriched, for sure. I love seeing these old drawings and ads. I wish the copy-right lwas could make an exception in the case of historical value.